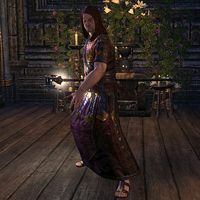 Artorius was the born into the wealthy Ancrus family in Cyrodiil. While his older brothers were established in their careers, Artorius grew up without a clear place in the world. As the youngest of the four brothers, tradition dictated that Artorius would live his life in service to the Divines, much to his disdain. 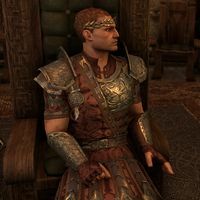 Fascinated by the ongoing battles between Emeric of Wayrest and Durcorach in High Rock, he scoured the Imperial City for anyone who could tell him more about the conflict, and usually found them in the most unsavory sections of the city. It was there he became acquainted with the notorious underworld boss, Vodunius Monrius, and began to run errands for him around 2E 541. Artorius relished the role and the excitement that accompanied it until one day he was collecting gold from the various merchants and artisans working in and around the Market District. Upon entering the shop of a Khajiiti baker, he found four Imperial officers of the city's Guard waiting for him. Thanks to his father's wealth and influence, the captain offered Artorius a way for him to make amends for the crimes he had committed. Artorius would spend a year with the priests of the Divines to set him straight, instead of experiencing the full weight of the law. Near the end of 2E 542, Artorius found himself in the Temple of the Divines in Wayrest serving penance - a destiny he had tried so hard to avoid. Artorius was placed under the watch of Ilavius Alfeno, a priest of Akatosh. Artorius's life became filled with an endless array of chores that included cleaning, food preparation, and helping to care for the shrines each day. He was also prescribed periods of study, meditation, and prayer. Artorius quickly became fascinated with the tales and tenets of the Divines, but had a particular affinity to Akatosh. When Primate Jonas Coventine arrived for his annual visit from Kvatch, he took an immediate liking to the young Artorius. After leading the temple in worship, the Primate invited Artorius to a private meeting. The details of the meeting remain a mystery, but shortly after Artorius pledged himself to the Divines. When his year of service was over, he took the vows of the priesthood and devoted himself to serving Akatosh. Artorius longed to be assigned to the Cathedral of Akatosh in Kvatch, and believed there was no other place in Tamriel where he could best serve and worship Akatosh. He set out using every avenue at his disposal to make himself enticing to the high priests and the Primate. Eventually, an event known as "The Miracle of the First Shrine" was what realized his dream. When a hunter brought his young son to the temple with a terrible wound, Priest Artorius immediately went to his aid. 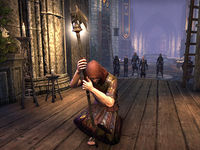 Even though the child had been killed by the injury, Artorius began to pray to Akatosh's shrine with the grieving father. According to legend, Artorius prayed for three straight days, never pausing to eat, or drink, or even sleep. At the end of the third day, Artorius began to speak rapidly in a tongue that no one in the temple could understand. Then a burst of brilliant light emanated from the shrine. It struck Artorius and flowed through his body, down his arms, and into his hands before passing on to the dead boy. When the glow subsided, the wound was healed, and the child was alive. It was claimed that Akatosh had answered Artorius's prayers. Word of this reputed miracle spread throughout the Empire, quickly reaching the attention of Primate Jonas Coventine. He decided that if Akatosh was indeed performing miracles through one of his priests, then that priest needed to be at the Cathedral in Kvatch. Soon, Artorius was serving at the Cathedral of Akatosh under the close tutelage of the Primate. Over time, Artorius rose through the hierarchy of the Cathedral, eventually becoming Grand Sermonizer of Akatosh, second only to the Primate of Kvatch himself. Around 2E 560, the relationship between the Primate and Artorius became strained. Artorius wanted the clergy to become more involved in the growing political unrest spreading throughout the Empire, as well as with the increasing threat of the Knahaten Flu. Primate Jonas wanted the Cathedral to remain distant from secular issues. The two argued constantly about the subject, reaching the point where the Primate was prepared to put an end to the disagreement by sending Artorius to a distant posting. Despite his spiritual demeanour, Artorius was ruthless and power hungry and conspired to remove Primate Jonas from his position. He secretly performed the Black Sacrament and contacted the Dark Brotherhood to arrange his murder. Although he publicly preached about the evils of such cults and organizations, Artorius had no qualms in doing business with them. The Dark Brotherhood sent a troubled assassin to Kvatch to carry out the contract. Primate Jonas' murder was presented to the public as a natural death, however rumors spread throughout Kvatch that implied foul play. In any case, Jonas's death paved the way for Artorius to advance to the highest echelon of the Chantry. Artorius changed his surname to Ponticus and became the Primate of Kvatch, and the religious authority of Cyrodiil. So auspicious was Artorius' investiture that the famous loom artist Gloria Medilus wove tapestries commemorating the ceremony. Immediately after Primate Jonas was murdered, Artorius confronted his assassin, Lyra Viria. He preyed on her insecurities of feeling lost, and her guilt over recently murdering her entire sanctuary. Seeking his own personal instrument of death, Artorius tried to convince her that Akatosh wanted them to join forces, and that the only way to atone for her sins and gain redemption was through him. His plan worked, and Lyra pledged her blade to him and agreed to carry out the holy work of the dragon god. She became known as the Black Dragon and the First Sword of the Order. During his reign as Primate, Artorius had a grudgingly civil relationship with Count Varen Aquilarios. When Varen left Kvatch to pursue his rebellion against Emperor Leovic in 2E 576, his nephew Carolus Aquilarios was left behind to protect the city. Still loyal to Emperor Leovic, Count Ephrem Benirus of Anvil sent Imperial forces to seize Varen's property and holdings, but Carolus repelled the attack with the aid of the Kvatch Warders. Although Primate Artorius sought a more influential position in the city's hierarchy, he put aside his ambitions while Carolus struggled to keep Kvatch safe. Varen's rebellion was successful and he was crowned emperor in 2E 577, and Carolus was officially named as Count of Kvatch. Carolus role was to govern while Primate Artorius handled spiritual matters and the Cathedral's defenders, but with the change in regime, Artorius began working to undermine the count's authority and carve out more power and influence for himself. Unexpectedly in the same year, a fleet of merchant warships and pirate vessels sailed into Anvil. Led by Fortunata ap Dugal, the fleet took control of the weakened city and declared that the Gold Coast was now a free and independent state. When she requested that Kvatch join Anvil as part of her new order, Carolus refused, preferring to pledge allegiance to Emperor Varen. 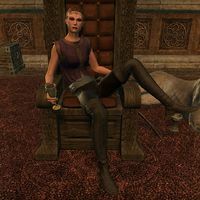 Fortunata begrudgingly accepted his position, but when Varen disappeared and the Empire collapsed in 2E 578, she took advantage of Kvatch's sudden isolation and made her demands more forceful. Ultimately, Fortunata's greater numbers prevailed, and Count Carolus had no choice but to swear fealty to an independent Gold Coast. These series of events led to the birth of a three-way power struggle over the Gold Coast between Artorius, Fortunata and Carolus. When the Three Banners War began in 2E 580, Artorius immediately set out to bolster the power and scope of the Order of the Hour. 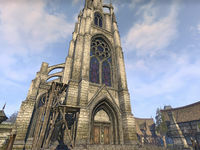 He instructed Commander Marcus Scipio to increase the size of the Order and set about expanding the Order's responsibilities beyond the boundaries of the Cathedral and into the rest of Kvatch. Artorius maintained that this was to reinforce the capabilities of the Kvatch Guard in dangerous times. Around 2E 583, given the volatile political situation, Artorius became concerned that the very organization that he employed to become Primate may be used against him. He decided to move against the Dark Brotherhood and wipe them out. In order to achieve this, he first needed to locate their sanctuary in the Gold Coast. The Black Dragon was chosen to head this task, given her past association with the shadowy organization. She was charged with kidnapping suspected Dark Brotherhood members and taking them to the At-Himah Family Estate, where Grand Sermonizer Fithia would interrogate them. Several members were tortured to death, but none revealed the location of the sanctuary. Publicly, Primate Artorias blamed the mysterious kidnappings and murders on the Dark Brotherhood, and ordered the Grand Sermonizer to deliver sermons urging Kvatch to stand against the Dark Brotherhood. He also petitioned Count Carolus for emergency powers to once again convert the Order into an army to protect the Cathedral and Kvatch. Carolus, refusing to allow a vigilante to walk the streets, granted Artorius the power to expand the Order of the Hour's authority, provided the Order returned to the Cathedral once the threat was resolved. The Order's numbers expanded quickly, and it grew larger than it ever had in its history. This move unsettled Governor Fortunata, who believed the Primate was building an army to eventually attack Anvil. The Brotherhood pushed back and murdered not only the chantry's street preachers speaking out against them, but the Grand Sermonizer herself. Artorius continued to fight by targeting various members of the Brotherhood, but lost more priests and soldiers of the order. Governor Fortunata, still troubled by Primate Artorius and Count Carolus expansion of the Order of the Hour, contracted the Dark Brotherhood to kill Commander Marcus Scipio to show Carolus the Order could not protect him. Commander Scipio was subsequently murdered, but in an unexpected turn of events, Count Carolus performed his own Black Sacrament. In an act of desperation, he ordered the death of Governor Fortunata to save Kvatch from her. The Dark Brotherhood complied and Governor Fortunata was killed in Anvil Castle. With the Pirate Queen dead, Primate Artorius quickly capitalized on the situation and decreed that any Red Sails pirates who agreed to abandon their criminal ways and join the Order of the Hour would receive full and unconditional pardons. As a result, many of Fortunata's old crew began flocking to the Order's enclave to join. Eventually, the Dark Brotherhood learned that the Black Dragon was in fact working for Primate Artorius. By this time, The Black Dragon had become disillusioned with Artorius' guidance and felt no sense of redemption. She left the chantry and fled to the Order's ancient headquarters, where she was cornered and eventually killed by Brotherhood assassins. Before she died, she revealed that Primate Artorius had learned of the location of the Dark Brotherhood headquarters and that he was moving in for the kill. In response, the Brotherhood decided upon a pre-emptive strike against Artorius before the Order could attack the sanctuary. 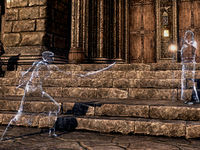 Several members of the Brotherhood stormed the tunnels below the Cathedral of Kvatch and dispatched numerous elite guards. Artorius confronted the band assassins once they reached the main hall and fought back. Despite possessing the power to manipulate the perception of time to make it seem like it had stopped, Artorius failed in stopping the assassins attack. As he lay defeated, the newest brotherhood recruit impaled Artorius upon his staff, killing him. With the Primate's death, Count Carolus Aquilarios emerged as the only remaining power on the Gold Coast. This page was last modified on 10 December 2018, at 09:43.